I hope you've had a wonderful week and are ready for a great weekend! We're heading into Christmas Break here and I'm so excited for a chance to catch up on some holiday reading. I think I have a fun line up for next week's posts, so stay tuned! 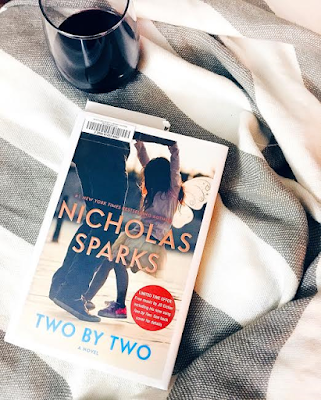 Today I'm reviewing the latest Nicholas Sparks novel, Two by Two. It was released earlier this fall, so maybe you've already read it! I've been a fan of Nicholas Sparks' work since The Notebook. I mean, really, who doesn't secretly love a great love story?! I will admit, I'm a hopeless romantic at heart and I love the way he can write about people falling in love. Two By Two is very different from his previous novels. In fact, Sparks' newest novel is the complete opposite of his past work. Unlike his previous novels that center around two people finding each other and starting a relationship, this book is about a relationship that is falling apart. Russell Green has everything - a great job, beautiful home, stunning wife and adorable daughter. Until suddenly, his world falls apart and he's scrambling to figure out what exactly went wrong. The core of this novel is watching Russ figure out how he's going to handle loss and adapt to a new life - one that he never planned on. There were elements that I liked in this book, and then there were a lot of things that I didn't like. The biggest problem was that unlike his earlier work, this novel didn't hook me (ever). I'm usually okay if it takes a few chapters to get into a book, but this never really interested me. In fact, this is one book that I read 3/4 of and skipped to the end to read the last page because I felt it was predictable enough that I wouldn't be missing too much if I read the ending without reading the entire novel. I just couldn't get into it and I never felt that I could relate to the characters. The writing is the same as it usually is, Nicholas Sparks is a good writer, but I felt that this novel was lacking that little extra that hooks the reader in. Character development was decent, but still didn't have the same effect on me as some of Nicholas Sparks' more memorable characters. Overall, I think that this book is fairly unremarkable and not memorable which was disappointing from such a well known author. Kudos to Nicholas Sparks for trying something different though! Or check out your local library!